A two bedroom first floor apartment for the over 55's. Situated within easy walking distance of the town centre the property also benefits from a balcony with rooftop views towards the church and is offered with no onward chain. 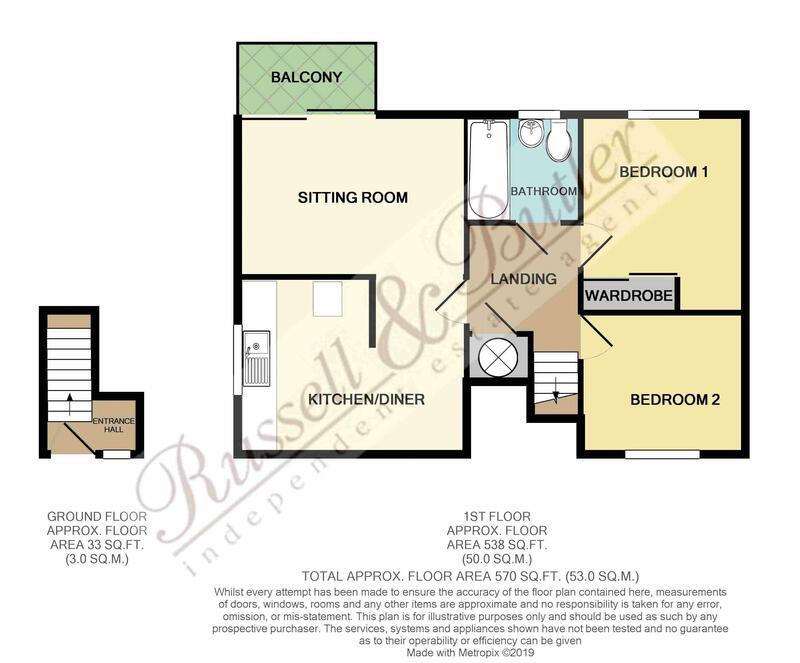 The accommodation comprises: Entrance hall, (There are only six steps to the first floor), Landing, Sitting room with balcony, kitchen/diner, two bedrooms and family bathroom. There are also plenty of parking spaces exclusive to the development. Energy Rating C.
Upvc double glazed window to front aspect, stairs rising to first floor. Night storage heater, access to loft space, airing cupboard housing hot water tank with immersion heater. Night storage heater, Upvc double glazed sliding doors to balcony. Inset single drainer sink unit with mono bloc mixer taps, cupboard under, a further range of base and eye level units, rolled edged work tops over, ceramic tiling to splash ares, plumbing for washing machine, night storage heater, Upvc double glazed window to side aspect. Having the benefit of built in wardrobes, electric radiator, Upvc double glazed window to rear aspect with views towards the church. Coloured suite of panel bath with 'Mira' electric shower over, glazed screen, wash hand basin, low level W/C, heater/towel rail, electric fan heater, Upvc double glazed window to rear aspect. Communal gardens and resident and visitor parking. All main services connected with the exception of gas. EPC rating TBC. Council Tax Band C. Lease Details 99 years on purchase Ground Rent/Service charge £82.54 per month collectively, to include buildings insurance, exterior window cleaning, Piper alarm system and upkeep of communal gardens and car parking.